Repair damaged skin and look years younger with this revolutionary serum that takes an innovative approach to making your skin healthier and more beautiful. Snail Repair Essence Serum utilizes the natural ingredients in snail secretion filtrate to smooth lines and wrinkles; exfoliate dead skin cells from the surface; and protect your skin from dangerous UV rays. 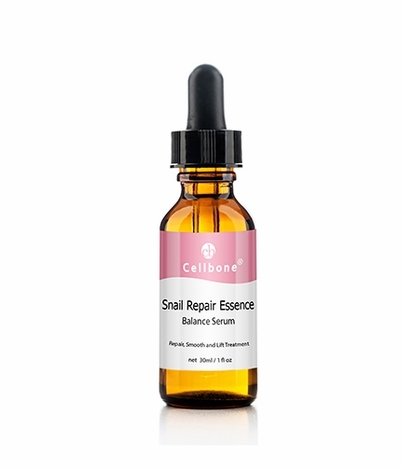 Snail Secretion offers numerous benefits to the skin including exfoliating properties, protection from UV rays and free radicals as well as the promotion of natural collagen and elastin growth. Extracted from the mollusca , the secretion is a completely natural skin healer that helps the snail itself restore, renew and hydrate its own skin. Spilanthes (Acmella Oleracea) Extract Fights Aging- Offering strong anti-aging effects, Spilanthes helps smooth expression lines around the mouth and eyes. Copper Peptide (GHK-Cu) Promotes Healthier Skin.- Copper Peptide is known to promote 'extra large' collagen aggregates degradation, more regular collagen synthesis, elastin, proteoglycans, glycosaminoglycans production, and anti-inflammatory and antioxidant responses that all help to firm and smooth aging skin. Hyaluronic Acid Adds Moisture - Known for its strong moisturizing effects on the skin, Hyaluronic Acid works by increasing viscoelasticity, and helping water bind to cells. Astaxanthin Provides Strong Antioxidant Relief -The strongest antioxidant vitamin found in nature, Astaxanthin is famous for its “super vitamin E” content. Five hundred times more effective than vitamin E, it works to prevent UA induced skin cancer. Plus, astaxanthin protects the skin from dangerous free radicals to reduce wrinkle & freckles. Treated with an Snail Secretion Filtrate containing 5% after 30 days. Apply a few drops on a clean, dry skin twice daily. Follow with your moisturizer of choice.